Wildfire was a major topic of discussion throughout the climate adaptation workshop. Climate change has enormous impacts on the Hawaiian Islands, and brushfire activity and it’s impacts are no exception. We have thousands upon thousands of residents and visitors at risk along the wildland-urban interface and as conditions continue to favor more brushfires and development continues to expand, more and more people will be at risk. 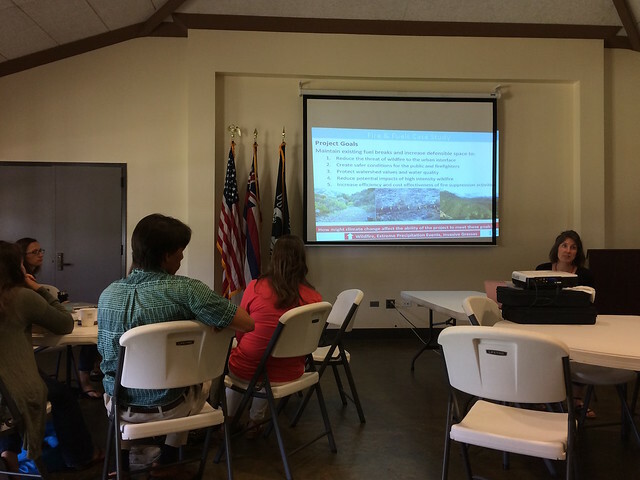 HWMO sent Community Outreach Coordinator, Pablo Beimler, to Oʻahu to share these concerns at the Oʻahu Climate Adaptation Workshop on April 24 and 25. The workshop was put on by Pacific Islands Climate Change Cooperative (PICCC), “a self-directed conservation alliance made up of local, state, federal, indigenous, and NGO member organizations from the US-Affiliated Pacific Islands” and EcoAdapt, “a non-profit organization that provides assistance throughout the entire climate adaptation process.” The two-day workshop was a great opportunity to not only share about how climate change impacts Hawaii’s wildfire situation, but also to discuss options for mitigating impacts, as well as connecting with others on Oʻahu interested in reducing those impacts.